A great American made, high quality round that can compete pretty favorably with value priced imports. A 50 grain projectile still maintains a significantly broad profile of versatility with regards to barrel twist rates and the sufficient power *(1225 ft. lbs.) and speed *(3325 FPS) make it suitable for tactical purposes where a FMJ projectile in a low grain weight would be suitable. 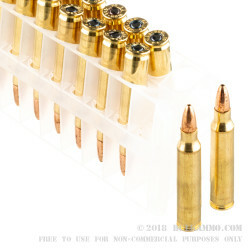 This is just a very good all-purpose load for most of what most people are doing with their rifles in .223; it offers a good solution to the high price of ammunition market wide. 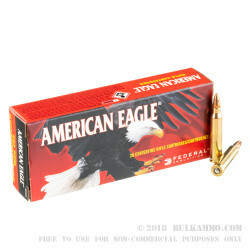 For the BulkAmmo price, and with the versatility it offers: the Federal American Eagle AE223G gives you more time on the range and a thicker wallet. 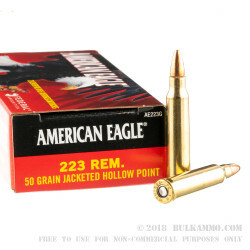 Suitable for any .223 Remington firearm. A: Hello Gerald, This Federal ammunition is made in their US based manufacturing facility.